I LOVE perfume. I'm sure it comes from my mom, who always has at least 10 different perfumes on her dresser, and always smells amazing. Unfortunately, it turns out that perfumes contain some very hazardous chemicals, which are not regulated by any health agency. In fact, fragrances are even exempt from disclosing ingredients, as they are considered a "trade secret". To make matters worse, because perfume is usually applied directly to the skin (the largest organ), the skin ends up absorbing many of these harmful chemicals, which accumulate in the system. 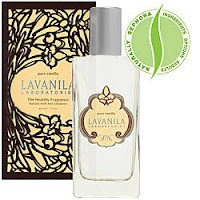 LaVanila - if you like soft, sweet, fruity perfumes, this is for you! This fragrance line is based on natural Madagascar vanilla, which they blend with other natural essential oils and topical antioxidants. They offer a full line of aromatheraphy candles, and body care, including deodorant - this happens to be my absolute favorite natural deodorant (and I've tried LOTS of brands!). Auric Blends - if you like more earthy, musky fragrances, you'll find just what you're looking for here! Using all natural essential oils, Auric Blends creates a wide array of roll-on fragrances, solid perfumes, and incense for both men and women. A little bit goes a long way with these products, and the price point is amazing! They also provide samples, so you can try the whole line and find your favorite. If none of these sound like what you're looking for, you can always create your own fragrance using individual essential oils. You can find these at your local health food store, and they're usually pretty affordable, so you can experiment and create your own signature scent! Have you found your favorite natural perfume?